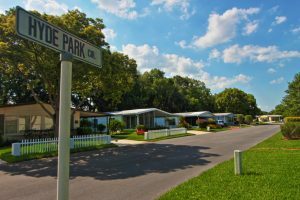 A community for ages 55 and up with manufactured homes for sale can make a big difference in the affordability factor of enjoying life in exciting Central Florida. That’s why you’ll want to check out Hyde Park, an active lifestyle community of high-quality, attractive manufactured homes only a short drive from the theme parks and entertainment venues of Orlando. Because of our location, plenty of adventures await our residents just outside our gates, but we know that mature adults also need a host of activities to enjoy right outside their door. That’s why our residents can enjoy daily access to resort-style amenities – including a pool, fitness center, and clubhouse meeting spaces – with their low monthly home site lease payment. We make this enviable Central FL lifestyle affordable for many baby boomers on a budget by offering manufactured housing in a gated, resort-style setting. Manufactured homes, after all, are every bit as comfortable as traditional site-built homes, even though they can cost considerably less. What’s more, the manufactured homes you’ll find at Hyde Park are designed to be low-maintenance. Combined with the lawn mowing services we provide, that means you’ll spend less time worrying about the upkeep of your home and have more time to enjoy activities inside and outside the community. For more information about the manufactured homes for sale at Hyde Park and the active, affordable lifestyle you can enjoy as a resident of our 55+ community in Central Florida, contact one of our friendly representatives today.